Roger Scruton: an excoriating critique of the intellectual conformism of the academy today. Williams shows how important historically academic freedom has been to the pursuit of knowledge, and examines the baleful consequences of the contemporary assault on truth and objectivity. Greg Lukianoff: essential reading for anyone who cares about academic freedom, wants to better understand the threats to it, and how to fight back. Frank Furedi: a compelling account of why academic freedom is in trouble. A powerful but nuanced study of the conformist campus. 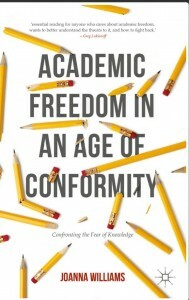 Wendy Kaminer: a sophisticated history and analysis of the rise and recent fall of academic freedom. Joanna Williams offers an accessible, scholarly account of the assault on reason and free inquiry by identity politics and the denigration of knowledge. Academic freedom is increasingly being threatened by a stifling culture of conformity in higher education that is restricting individual academics, the freedom of academic thought and the progress of knowledge – the very foundations upon which academia and universities are built. Once, scholars demanded academic freedom to critique existing knowledge and to pursue new truths. Today, while fondness for the rhetoric of academic freedom remains, it is increasingly criticised as an outdated and elitist concept by students and lecturers alike and called into question by a number of political and intellectual trends such as feminism, critical theory and identity politics. This provocative and compelling book traces the demise of academic freedom within the context of changing ideas about the purpose of the university and the nature of knowledge. The book argues that a challenge to this culture of conformity and censorship and a defence of academic free speech are needed for critique to be possible and for the intellectual project of evaluating existing knowledge and proposing new knowledge to be meaningful. This book is that challenge and a passionate call to arms for the power of academic thought today.